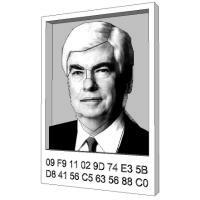 A crude little 3D printable portrait of a crude little man - Chris Dodd emblazoned with the 09F9 AACS encryption key. Print it, and behold the visage of yesteryear. As many will recall, the AACS encryption key (used in decrypting HD DVDs and Blu-ray discs) was at the center of a controversy in 2007, when aggressive MPAA takedowns of the hexadecimal series sparked a massive Streisand Effect that plastered the key all over popular websites like Digg. While this was hardly the only time that Dodd and the MPAA have clashed with the Pirate Bay community, it has since been commonly used as a symbol of the unstoppable nature of information online. So if you have a 3D printer and would like a constant reminder of "the visage of yesteryear", go ahead and extrude yourself one today. And if you're a former Senator who took over a major lobbying organization despite your promise not to become a lobbyist, go ahead and continue waging war with the internet community—they'll just keep finding creative ways to rub it in your face (or a 3D replica thereof). Is the plastic used by 3D printers soft enough for it to be used as a dartboard? As far as I know they have 3D printers that work with materials as hard as metals and as soft as wax. A wax print of this would be perfect, when it gets too beat up you can melt it back down and make another. How petty can they get? Dunno, when talking about the MAFIAA there seems to be no limit to how low they go. Apparently when you type 09 F9 11 02 9D 74 E3 5B D8 41 56 C5 63 56 88 C0 on TechDirt, it sends your message for review. Probably some filter to stop spamming of random gibberish, from bots and trolls probably. Holy smokes this could be one of the best jokes of the decade! I certainly laughed warmly. Quick, some1 print that and send a copy to Mr Dodd with a $58 billion copyright tab along with it where you can clearly read "The Pirate Bay� All Rights Reserved". And an iPod filled with mp3 with a note "As a token of our gratitude for your efforts please accept this iPod valued at $8 billion lost sales" for added lulz. I think they need to incorporate a Guy Fawkes style moustache and beard into a version. That would be horridly disrespectful to Guy Fawkes memory, as well as Guy Fawkes masks everywhere. Hey! That violates his publicity rights! There should be a 3D representation of the power of the FBI to bend the reality...I mean the law. That would require at least 5 dimensions. I extruded something else that reminded me of Chris Dodd today. How odd, I'm about to do the same. But as a matter of fact the 'work of art' you created and I'm about to create probably resemble an awful lot of ppl in the politics. Am I the only one who doesn't get it? I mean, Dodd wasn't working for the MPAA when the 09F9 key was publicized. Did he have anything to do with that incident at all..? ...well it comes down to personal opinion on whether or not you consider what senators do as actually doing something. Did he exercise any of his Senatorial powers in any way during the 09F9 incident? That's what I'm trying to get at. Why is Dodd's face next to this key? What is the relevance? I'm not saying this to defend Dodd. It was pretty sleazy how he said "I won't be a lobbyist" and then goes to work for the MPAA right after leaving the Senate. I just don't see how the AACS key has anything to do with Dodd at all, other than that they're both related to the MPAA. Dodd joined the MPAA last year. Marcus wrote the story and apparently ignores facts that deviate from his narrative. I'll call them "Lobitcians" (TM, Patent Pending, Copyrighted...) with the catch phrase, "Gotta catch em all!" on the back along with the collectors number (if I don't get sued for the references). gross? the revenues from that would be obscene! Print on and send it to Dodd.